If I have to list things I like about Korea, I could come up with bunch of items, and Korean food would surely top the list. I am not a foodie type of person, I choose what I eat, and most of the time, I am not experimental when it comes to eating. I prefer to eat what’s familiar to me and sometimes refuse to try foods that are strangers to my taste bud. Eating Korean food was and is still a challenge for me, although I have a safe list of Korean food that I like, there are Korean dishes that I could not really take, one example is Kimchi. Yes folks, I still don’t like kimchi, even after four years of meeting it everyday on the dining table. I eat kimchi if it’s on a dish like Kimchi chigae, budae chigae and Samgyupsal, but eating kimchi alone is not something that appeases my appetite. I know I have to awaken the foodie part of me because I like to eat, except that I just can’t eat everything. While I can say nothing’s wrong with that, I just felt like I missed the adventure of trying to eat food from different parts of the world. So when I learned that Korea will be hosting a Food Week, I registered online because I want to introduce myself to the food of the world. 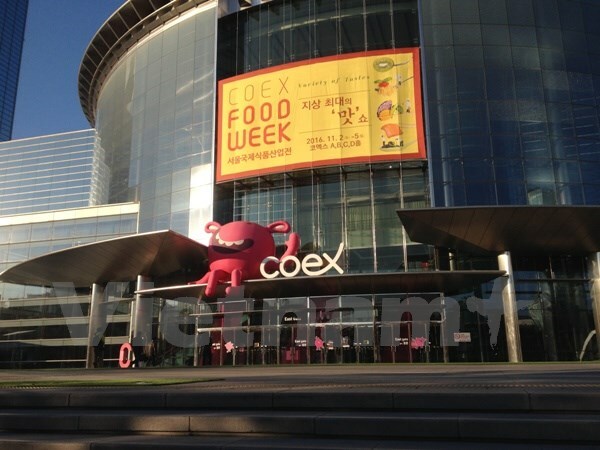 The Food Week Korea was held last November 2 to 5, 2016. I attended the last day of the exhibit. Korea invited different delegations all around the world to represent their respective countries and exhibit anything related to food at the COEX convention and Exhibition Center located in Seoul, South Korea. So basically, it’s about bringing the food industry of the world in one roof and I know I should not miss that opportunity. When I arrived at the venue, there were a lot of people seeing that it was the last day of the exhibit. I had to patiently wait for my turn to get a visitor’s ID because there was a long line. Both foreigners and locals were so much interested to see what’s in the exhibit. I could not exactly figure out the demographics of the visitors because there were a lot of people. I am guessing most of them are gastronomes, I saw how everyone was interested to check the food products on display. I also spotted gourmets, although I was just judging on the way they dressed and the way they approached business representatives, but I am sure rich people who are interested in food would not want to miss this event. Or maybe just curious people like me. Whatever you call it, we are sharing one roof for a gastronomic indulgence. I must say that every country was well represented in this exhibit. The booths were divided so that participants from one country can all go together in one lane which I think was a practical way for the benefits of the visitors. Attendees who want to take the opportunity to develop business relationship to international clients can easily approach and choose a company from a preferred country. I arrived a little late for the event, it was almost lunchtime when I arrived and a friend who has arrived in the venue way earlier than me ushered me from the entrance the moment I got my ID. I was starving when I arrived and I was glad there were food everywhere, it was not that difficult to grab something to eat. However, I was more interested to meet the Philippine representatives so we went directly to the booth. And look what I’ve found, food products from the Philippines, and not just Philippines, it’s from my own province, the SOCCSKSARGEN region. There were dried mangoes, dried papaya, dried pineapple, dried banana and coffee. I was so much interested with the coffee and asked the Department of Agriculture representative to help me plant coffee when I go back home. I think I can produce coffee beans if I have the right materials and inputs on how to grow it. Aside from food products from my region, there are also booths of famous food brands from the Philippines, like Mama Sitas. I think every Filipino knows Mama Sitas, they brought all their products to present it to Korea and other international visitors. I met the brand Manager and talked to him for a while, he showed me some of their products and gave me samples. I can feel his desire to reach out to Filipino workers in South Korea and introduce Mama Sitas. So maybe, in the future, every Filipino in Korea who wants to cook Filipino dish can easily cook with the help of Mama Sitas product if it becomes available in the market. There were several Mama Sitas products in Asian Stores, but you cannot always guarantee the stock availability. There are also other Philippine local food products like the Buko juice from Batangas, banana, pineapple, and calamansi. It was a joy watching foreigners and Koreans enjoying the free taste of Filipino food products. Everybody likes it especially the coffee which really inspired me more to become a producer of coffee beans in the Philippines. I also checked other booths and introduced myself to other food products of other countries. I saw the food and tasted some food products from Brazil, Malaysia, Singapore, Brunei, Indonesia, Vietnam, Thailand, Myanmar and Laos. The biggest chunk of the pavilion I think goes to the Korean food. Let’s give it to them, they are the host of this event, so it’s just appropriate they take the bigger part of the venue. I think every province of South Korea has a representative. I didn’t know there’s “food specialty” in the provinces of South Korea. I used to believe that the food you can buy in Seoul is also available in Taean or Busan or Daegu or any part per se. I just learned that Korean provinces have specialized food products. The event was so interactive. There were games in some of the booths and there were prizes too. I joined some of the games and won some prizes which are actually food products. At the end of the day, I was able to bring home an apple, a peach, two packs of rice of different kinds, and freebies from Mama Sitas. I also bought some products like the apple juice because they’re selling it at a discounted price. I think what I like the most is the ASEAN-Korea Center. It’s an area where you get to eat a meal from two different countries. They’re giving away coupons at the entrance for free if you download a particular app and they give two random countries for you to try their food. I especially requested if I can have Philippines, and they gave me Philippines and Thailand. Of course, I first visited the Philippine booth and they served Sinigang na hipon, Champorado and Adobo rice. My thai food set composed of a spicy thai noodles and a pork curry. I also checked out other food from other ASEAN countries but I was not allowed to get from them because I only got two coupons. It was a unique experience for me to attend this one of a kind event. It was a great learning opportunity, a possible business idea, and a food trip kind of event and I think it’s a good way to not only promote food products of one country but also open new avenues and opportunities to food industry all around the globe. Hopefully I can attend this event next time, not as a visitor but an exhibitor.